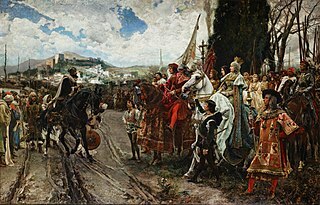 The Reconquista is a name used in English to describe the period in the history of the Iberian Peninsula of about 780 years between the Umayyad conquest of Hispania in 711 and the fall of the Nasrid kingdom of Granada to the expanding Christian kingdoms in 1491. 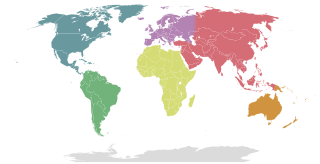 The completed conquest of Granada was the context of the Spanish voyages of discovery and conquest, and the Americas—the "New World"—ushered in the era of the Spanish and Portuguese colonial empires. Mudéjar refers to an architecture and decoration style in (post-Moorish) Christian Iberia that was strongly influenced by Moorish taste and workmanship, reaching its greatest expression in medieval Aragon, Andalusia and the city of Toledo. Mudéjar also refers to the large group of Muslims in Spain who remained in Christian Iberia despite their territories being reconquered. The distinctive Mudéjar style is still evident in regional architecture, as well as in music, art, and crafts, especially Hispano-Moresque ware, lustreware pottery that was widely exported across Europe. The Mudéjar style was first characterized as a specific aesthetic trend by Spanish art historian Pedro de Madrazo in 1888. This important distinction clarified that the specific qualities were not just signature of specific artisans or craftsmen but it was the collective aesthetic style of Mudéjar Muslims in the Iberian peninsula. The Oran fatwa was a responsum fatwa, or an Islamic legal opinion, issued in 1504 to address the crisis that occurred when Muslims in the Crown of Castile were forced to convert to Christianity in 1500–1502. The fatwa sets out detailed relaxations of the sharia requirements, allowing the Muslims to conform outwardly to Christianity and perform acts that are ordinarily forbidden in Islamic law, when necessary to survive. It includes relaxed instructions for fulfilling the ritual prayers, the ritual charity, and the ritual ablution, and recommendations when obliged to violate Islamic law, such as worshipping as Christians, committing blasphemy, and consuming pork and wine. Islam has been present in Spain since the Umayyad conquest of Hispania in the eighth century. At the beginning of the twelfth century, the Muslim population in the Iberian Peninsula – called "Al-Andalus" by the Muslims – was estimated to number as high as 5.5 million; among these were Arabs, Berbers and indigenous converts. In the next few centuries, as the Christians pushed from the north in a process called reconquista , the Muslim population declined. At the end of the fifteenth century, the reconquista culminated in the fall of Granada, with the Muslim population of Spain estimated to be between 500,000 and 600,000 out of a total Spanish population of 7 to 8 million. Approximately half of the Muslims lived in the former Emirate of Granada, the last independent Muslim state in Spain, which had been annexed by the Crown of Castile. About 20,000 Muslims lived in other territories of Castile, and most of the remainder lived in the territories of the Crown of Aragon. These Muslims living under Christian rule were known as the Mudéjars. The Umayyad conquest of Hispania was the initial expansion of the Umayyad Caliphate over Hispania, largely extending from 711 to 788. The conquest resulted in the destruction of the Visigothic Kingdom and the establishment of the independent Emirate of Córdoba under Abd ar-Rahman I, who completed the unification of Muslim-ruled Iberia, or al-Andalus (756–788). The conquest marks the westernmost expansion of both the Umayyad Caliphate and Muslim rule into Europe. Francisco Jiménez de Cisneros, O.F.M., known as Ximenes de Cisneros in his own lifetime, and commonly referred to today as simply Cisneros, was a Spanish cardinal, religious figure, and statesman. Starting from humble beginnings he rose to the heights of power becoming a religious reformer, twice regent of Spain, Cardinal, Grand Inquisitor, promoter of the Crusades in North Africa, and founder of the Complutense University, today the Complutense University of Madrid. Among his intellectual accomplishments, he is best known for funding the Complutensian Polyglot Bible, the first printed polyglot version of the entire Bible. He also edited and published the first printed editions of the missal and the breviary of the Mozarabic Rite, and established a chapel with a college of thirteen priests to celebrate the Mozarabic Liturgy of the Hours and Eucharist each day in the Toledo Cathedral. La Convivencia is an academic hypothesis regarding the period of Spanish history from the Muslim Umayyad conquest of Hispania in the early eighth century until the expulsion of the Jews in 1492. It claims that in the different Moorish Iberian kingdoms, the Muslims, Christians and Jews lived in relative peace. According to this interpretation of history, this period of religious diversity differs from later Spanish and Portuguese history when - as a result of expulsions and forced conversions - Catholicism became the sole religion in the Iberian Peninsula. This is a timeline of notable events during the period of Muslim presence in Iberia, starting with the Umayyad conquest in the 8th century. The rebellion of the Alpujarras of 1568–71, sometimes called the War of the Alpujarras or the Morisco Revolt, was the second such revolt against the Castilian Crown in the mountainous Alpujarra region. The rebels were Moriscos, the nominally Catholic descendants of the Mudéjares following the first rebellion of the Alpujarras (1499–1501). Islam was a widespread religion in what is now Spain and Portugal for nine centuries, beginning with the Umayyad conquest of Hispania and ending with its prohibition by the modern Spanish state in the mid-16th century and the expulsion of the Moriscos in the early 17th century. Although a significant proportion of Moriscos returned to Spain or avoided expulsion through various means, and the decree never affected the country's large enslaved Muslim population, the indigenous practice of Islam had faded into obscurity by the 19th century. Abu Abdullah Muhammad ibn Yusuf ibn Nasr, also known as Ibn al-Aḥmar and by his epithet al-Ghalib billah, was the first ruler of the Emirate of Granada, the last independent Muslim state on the Iberian Peninsula, and the founder of its ruling Nasrid dynasty. He lived during a time when Iberia's Christian kingdoms—especially Portugal, Castile and Aragon—were expanding at the expense of the Islamic territory in Iberia, called Al-Andalus. Muhammad ibn Yusuf took power in his native Arjona in 1232 when he rebelled against the de facto leader of Al-Andalus, Ibn Hud. During this rebellion, he was able to take control of Córdoba and Seville briefly, before he lost both cities to Ibn Hud. Forced to acknowledge Ibn Hud's suzerainty, Muhammad was able to retain Arjona and Jaén. In 1236, he betrayed Ibn Hud by helping Ferdinand III of Castile take Córdoba. In the years that followed, Muhammad was able to gain control over the southern cities, including Granada (1237), Almería (1238) and Málaga (1239). In 1244, he lost Arjona to Castile. Two years later, in 1246, he agreed to surrender Jaén and accept Ferdinand's overlordship in exchange for peace. The Treaty of Granada was signed and ratified on November 25, 1491 between Boabdil, the sultan of Granada, and Ferdinand and Isabella, the King and Queen of Castile, León, Aragon and Sicily. It ended the Granada War which had started in 1482, culminating in the siege and battle of Granada beginning in spring 1491. Laujar de Andarax is a municipality of Almería province, in the autonomous community of Andalusia, Spain. The Emirate of Granada, also known as the Nasrid Kingdom of Granada, was an emirate established in 1230 by Muhammad ibn al-Ahmar. After Prince Idris left Iberia to take the Almohad Caliphate leadership, the ambitious Ibn al-Ahmar established the last Muslim dynasty on the Iberian peninsula, the Nasrids. The Nasrid emirs were responsible for building the Alhambra palace complex as it is known today. By 1250, the Emirate was the last part of the Iberian peninsula held by the Muslims. It roughly corresponded to the modern Spanish provinces of Granada, Almería, and Málaga. Andalusian Arabic was the mother tongue of the majority of the population. For two more centuries, the region enjoyed considerable cultural and economic prosperity. The Expulsion of the Moriscos was decreed by King Philip III of Spain on April 9, 1609. The Moriscos were descendants of Spain's Muslim population that had converted to Christianity by coercion or by Royal Decree in the early 16th century. Since the Spanish were fighting wars in the Americas, feeling threatened by the Turks raiding along the Spanish coast and by two Morisco revolts in the century since Islam was outlawed in Spain, it seems the expulsions were a reaction to an internal problem of the stretched Spanish Empire. Between 1609 through 1614, the Crown systematically expelled Moriscos through a number of decrees affecting Spain's various kingdoms, meeting varying levels of success. The Granada War was a series of military campaigns between 1482 and 1491, during the reign of the Catholic Monarchs Isabella I of Castile and Ferdinand II of Aragon, against the Nasrid dynasty's Emirate of Granada. It ended with the defeat of Granada and its annexation by Castile, ending all Islamic rule on the Iberian peninsula. The Kingdom of Granada was a territorial jurisdiction of the Crown of Castile from the conclusion of the Reconquista in 1492 until Javier de Burgos' provincial division of Spain in 1833. 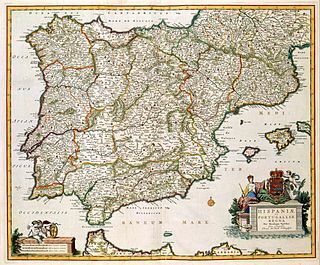 This was a "kingdom" ("reino") in the second sense given by the Diccionario de la lengua española de la Real Academia Española: the Crown of Castile consisted of several such kingdoms. Its extent is detailed in Gelo del Cabildo's 1751 Respuestas Generales del Catastro de Ensenada (1750–54), which was part of the documentation of a census. Like the other kingdoms within Spain, the Kingdom of Granada was abolished by the 1833 territorial division of Spain. The Rebellion of the Alpujarras (1499–1501) was a series of uprisings by the Muslim population of the Kingdom of Granada, Crown of Castile against their Catholic rulers. They began in 1499 in the city of Granada in response to mass forced conversion of the Muslim population to the Catholic faith, which were perceived as violations of the 1491 Treaty of Granada. The uprising in the city quickly died down, but it was followed by more serious revolts in the nearby mountainous area of the Alpujarras. The Catholic forces, on some occasions led personally by King Ferdinand, succeeded in suppressing the revolts and inflicted severe punishment on the Muslim population. The Young Man of Arévalo was a Morisco crypto-Muslim author from Arévalo, Castile who was the most productive known Islamic author in Spain during the period after the forced conversion of Muslims there. He traveled widely across Spain to visit crypto-Muslim communities and wrote several works about Islam which includes accounts from his travels. His real identity and dates of birth and death are unknown, but most of his travels took place in the first half of the sixteenth century. The Mudéjar revolt of 1264–1266 was a Mudéjar rebellion in the Lower Andalusia and Murcia regions of the Crown of Castile. The rebellion was in response to Castile's policy of relocating Muslim populations from these regions and was partially instigated by Muhammad I of Granada. 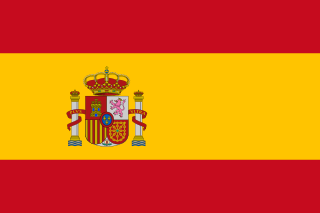 The rebels were aided by the independent Emirate of Granada, while the Castilians were allied with Aragon. Early in the uprising, the rebels managed to capture Murcia and Jerez, as well as several smaller towns, but were eventually defeated by the royal forces. Subsequently, Castile expelled the Muslim populations of the reconquered territories and encouraged Christians from elsewhere to settle their lands. Granada became a vassal of Castile and paid an annual tribute. 1 2 3 4 Harvey 2005, p. 14. 1 2 3 Carr 2009, p. 40. ↑ Harvey 1992, p. 9. ↑ Carr 2009, pp. 40–41. ↑ Carr 2009, p. 52. 1 2 Harvey 2005, pp. 85–86. ↑ Carr 2009, p. 81. ↑ Harvey 1992, p. 325. ↑ Harvey 2005, pp. 15–16. ↑ Harvey 2005, pp. 20. ↑ Harvey 2005, pp. 257. 1 2 3 4 5 6 7 8 9 10 Catlos 2014, p. 220. ↑ Carr 2009, p. 57. 1 2 Harvey 2005, p. 27. 1 2 3 Carr 2009, p. 58. ↑ Coleman 2003, p. 6. 1 2 3 4 Carr 2009, p. 60. 1 2 3 Harvey 2005, p. 31. 1 2 3 4 Carr 2009, p. 63. ↑ Harvey 2005, p. 36. 1 2 Harvey 2005, p. 45. 1 2 3 4 5 6 7 8 Harvey 2005, p. 57. 1 2 3 Harvey 2005, p. 56. ↑ Edwards 2014, p. 99. 1 2 3 Edwards 2014, p. 100. ↑ Harvey 2005, pp. 56–7. 1 2 3 4 5 6 Harvey 2005, p. 58. ↑ Harvey 2005, p. 29. 1 2 Harvey 2005, p. 86. ↑ Harvey 2005, p. 92. 1 2 3 4 Harvey 2005, p. 93. ↑ Lea 1901, p. 71. 1 2 3 4 5 6 7 8 9 10 Harvey 2005, p. 94. ↑ Lea 1901, p. 75. 1 2 Lea 1901, p. 83. 1 2 Lea 1901, p. 84. 1 2 Catlos 2014, p. 226. 1 2 3 Catlos 2014, p. 227. 1 2 Harvey 2005, p. 99. 1 2 3 4 Lea 1901, p. 87. 1 2 Harvey 2005, pp. 99–100. ↑ Harvey 2005, p. 101. ↑ Catlos 2014, pp. 226–227. 1 2 3 4 Harvey 2005, p. 49. ↑ Harvey 2005, p. 102,256. 1 2 Rosa-Rodríguez 2010, p. 153. ↑ Harvey 2005, p. 52. ↑ Rosa-Rodríguez 2010, pp. 153–154. ↑ Harvey 2005, p. 185. 1 2 Harvey 2005, p. 181. ↑ Harvey 2005, p. 182. 1 2 Harvey 2005, p. 60. 1 2 Stewart 2007, p. 266. ↑ Harvey 2005, pp. 61–62. 1 2 Harvey 2005, p. 64. ↑ Harvey 2005, pp. 63–64. ↑ Stewart 2007, p. 298. ↑ Hendrickson 2009, p. 25. 1 2 Harvey 2005, p. 48. ↑ Carr 2009, p. 65. ↑ Lea 1901, p. 40. ↑ Harvey 2005, pp. 48–49. ↑ Lea 1901, p. 33. ↑ Carr 2009, p. 59. 1 2 3 4 Harvey 2005, p. 100. ↑ Lea 1901, p. 91. ↑ Lea 1901, pp. 91–92. ↑ Lea 1901, pp. 92. ↑ Lea 1901, pp. 93–94. 1 2 Lea 1901, p. 94. ↑ Lea 1901, p. 95. 1 2 3 Carr 2009, p. 64. ↑ Harvey 2005, p. 82. Dadson, Trevor (February 10, 2006). "Moors of La Mancha" . The Times Literary Supplement . Harvey, L. P. (February 24, 2006). "Fatwas in early modern Spain" . The Times Literary Supplement .